Violinist Melissa Hernandez began lessons at the age of 6 in Minneapolis, MN. She has soloed twice with the Hillsdale College Orchestra, performed in the Czech Republic, Dominican Republic, and throughout Great Britain. When she is not on stage playing tango, she is on the dance floor showing some smooth dance moves! 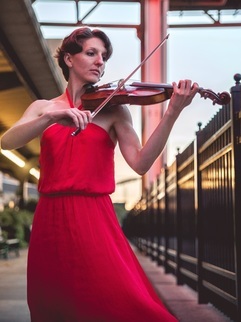 Violinist Jennifer Sternick is an enthusiastic freelance musician. 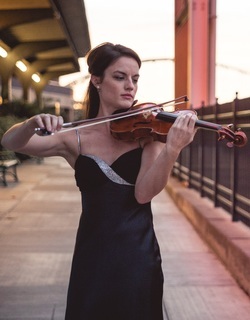 Holding concertmaster positions in both eastern and western Pennsylvania, her versatility takes her from the concert stage as a soloist, to an intimate setting for chamber music, to the music hall with a symphony orchestra, to the last seat of a moving school bus for a uniquely guided audience tour! Alejandro Pinzón is a multidisciplinary artist with a lifelong interest in self-expression through art. He first encountered tango in the early 2000’s and since then, his “addiction” to it keeps growing. He plays bandoneón, violin, and is also Cuarteto Bravo’s band leader. He's not too bad on the dance floor either, but his true skill resides in his ability to carry instruments and a bunch of equipment, all in one trip! 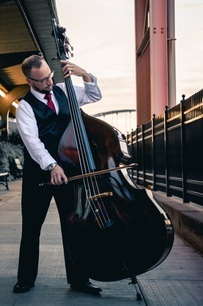 Dan Morrison is a busy bass player in the Pittsburgh area. You can see him in tuxedo playing classical music, jeans and a nice shirt playing jazz or rock and well… a vest playing tangos. He has played in many orchestras in the area and toured throughout Europe and Asia with several festival orchestras. His musical talent and intuition, but specially his looks, landed him the position as Cuarteto Bravo’s bass player!